A pair of independent travelers with an inspired itinerary decided to satisfy two proverbial “bucket list” adventures… driving a vintage Italian car through Tuscany and returning to one of our favorite hotels and its exquisite restaurant. When you have the ability to create your own itinerary the planning process can become a creative adventure. 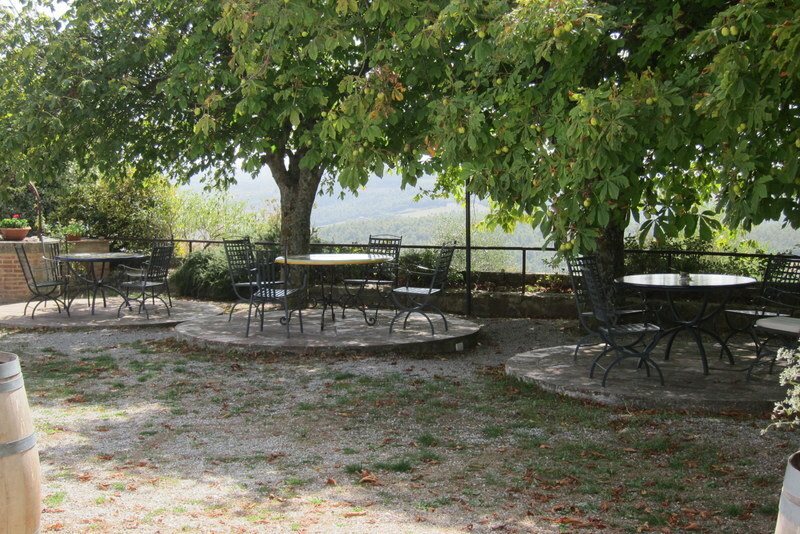 The ristorante and hotel, La Chiusa (www.ristorantelachiusa.it) located in Montefollonico, Tuscany is situated in the hills southeast of Siena. It is an old farmhouse converted into fifteen unique rooms with the fantastic bonus of operating one of the best restaurants in Italy. The owners, Dania Masotti and Umberto Lucherini are two of the most gracious as well as delightful personalities that you would come across and Dania is an excellent chef too. She also offers cooking classes and has written a cookbook based on her culinary skills and knowledge. On our first visit to Italy over twenty years ago we stayed at this hotel which was and still is recommended by “Karen Brown Travel Adventures”. Our room and the view was perfect and it had a large soaking tub which is an unusual feature. The people, the atmosphere, the room, the views, and especially the dining experience have made an indelible impression on us after all these years. 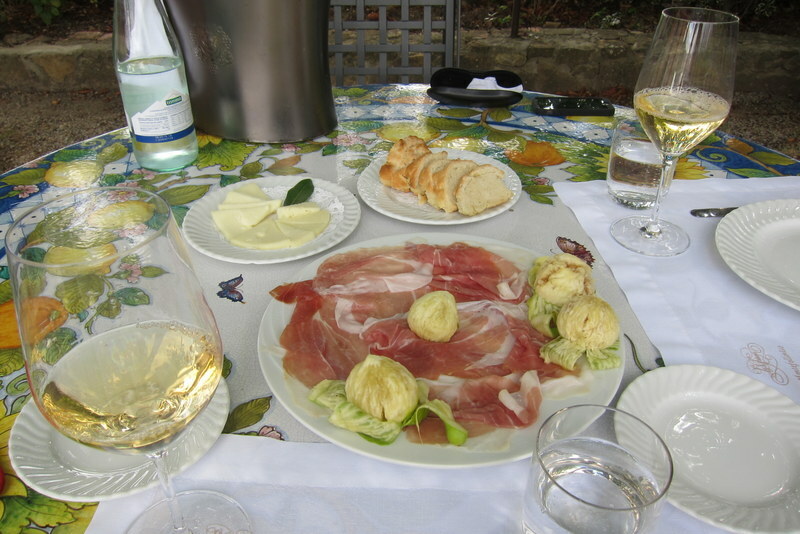 The second visit to La Chiusa was not a planned return and only happened because when we arrived at our hotel, Residenza d’Arte in Torrita di Siena during riposo (nap time) we found that everything was closed for the afternoon. 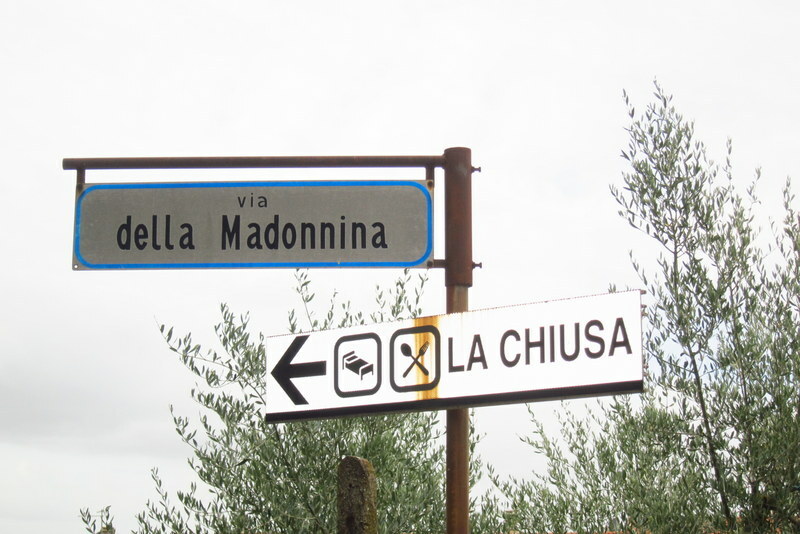 We were famished after a long drive so we set out in search of the suggested alternatives and somehow our “Travel Angels” led us this way and that until we literally stumbled upon the familiar La Chiusa farmhouse. Umberto looked up, smiled and said “I remember you!” We were skeptical, to say the least, but it turned out he has an uncanny memory and was not kidding. “Please sit at the table under the chestnut tree and we will bring you something to eat”. He selected a white wine and the feast began. We finally raised up our hands and said ”basta” (enough) we cannot eat anymore….. The experience was magical, the food was “simple” and spectacular. The way we were treated was the epitome of Italian warmth. They endeared us to them. We vowed to return again one day and added it to our bucket list. Two of the leading benefits of using a vacation rental versus a hotel are the cost savings and the more spacious accommodations. With the per night unit cost being more reasonable you can take an overnight trip to another village by simply packing a small bag, leaving the bulk of your luggage in a locked up apartment and off you go! We opted to go back to La Chiusa. We perused the internet and determined that “zephyrus-classic-car-rental.com” had the best selections, reasonable prices and were the most responsive to our numerous questions. We selected their Duetto Osso di Seppia which is a 1966 Alfa Romeo (no… not the one from “The Graduate” fame as it was already booked). The company also offers travel tours and other organized events but being the independent types we opted for a solo rental plan. Booking the car was a bit of a challenge and a leap-of-faith too. We had to prepay the rental fee with a credit card (which added some level of security) and kept an open line of communications with the Zephyrus Team. They were very responsive but you never know until you actually get there and see the car. “Meet us in the town of ‘Chiusi Chianciano Terme’ at the railroad station and look for a red Alfa”… another leap-off-faith. Will they be there? We got off the Autostrada in Chiusi and began checking our GPS and road signage for the railroad markers but no need as Matteo anticipated our possible confusion and met us on the off ramp. We followed him to the parking lot where we would drop our Hertz rental. We signed some paperwork and he gave us a few mechanical instructions and “Oh, yes, your GPS will work… the cigarette lighter is right there”. And off he went with a cheery “CIAO”. And there we sat, in this old car whose exterior was certainly cherry, but whose interior left much to be desired… we are talking original 1966. OK, so we familiarized ourselves with the clutch, brakes, mirrors, and we are ready to head into the Tuscan countryside… plugged in the GPS, but, sorry, the cigarette lighter doesn’t work. Oh well, we have a map and we kind of know where we are going. Driving a classic Italian automobile has its moments to say the least. The gears were “grinding”, the clutch is hydraulic and very stiff, fumes from the stinky exhaust waft through the car and you start to think… what on earth are we doing? Rumbling down century’s old country roads and viewing the Tuscan hillside in a red 1966 Alfa is simply so much fun that any car enthusiast has to experience it for themselves. This Alfa had a 1570 cc variation of the Alfa Romeo twin cam four cylinder engine, coupled with dual Weber two-barrel side-draft carburetors which, all said and done, produced 109 horse power @ 6,000 rpm, packaged in a 2,183 pound body. When you added the five speed manual transmission, disc brakes and an independent front suspension you had a classic design and a pretty nice ride. It attracted people so much so that they waved and greeted us, and other cars gave us the right of way… apparently Italians still love this car. Getting lost in a foreign country, with only a map and a smile adds a little excitement to your day. As a possible solution we fired up the iPhone and Google Maps to find our way to La Chiusa and found out the stark reality that cell coverage is spotty… no joy and no lasting signal. Back to asking the locals for directions using the car as a conversation magnet. The “driver” specifically asked the “navigator” not to go into a large city and to avoid traffic at all costs. So naturally we wound up in Montepulciano at their busiest traffic junction and at the most hectic time of the day! Driving a vintage automobile in the countryside is a heck of a lot more fun than sitting in traffic with an uphill slope and the reflection of the front end of a tour bus poised right on your bumper in the rear view mirror added an interesting twist to the day… va bene (so be it)! 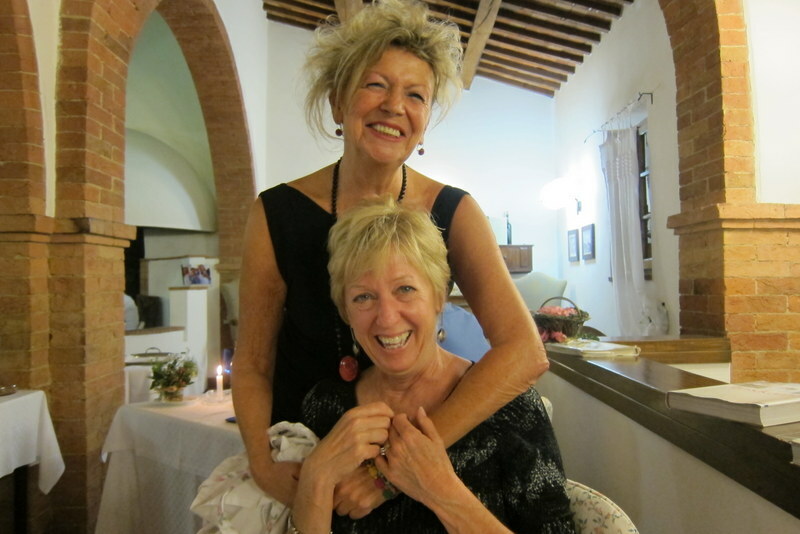 We have all heard the expression “the third time’s the charm” and so it was at La Chiusa. We made it to La Chiusa in the late afternoon, parked the Alfa and found a glass of wine to celebrate the survival of this part of the adventure. We enjoyed a spacious room, with a fabulous view and a soaking tub! 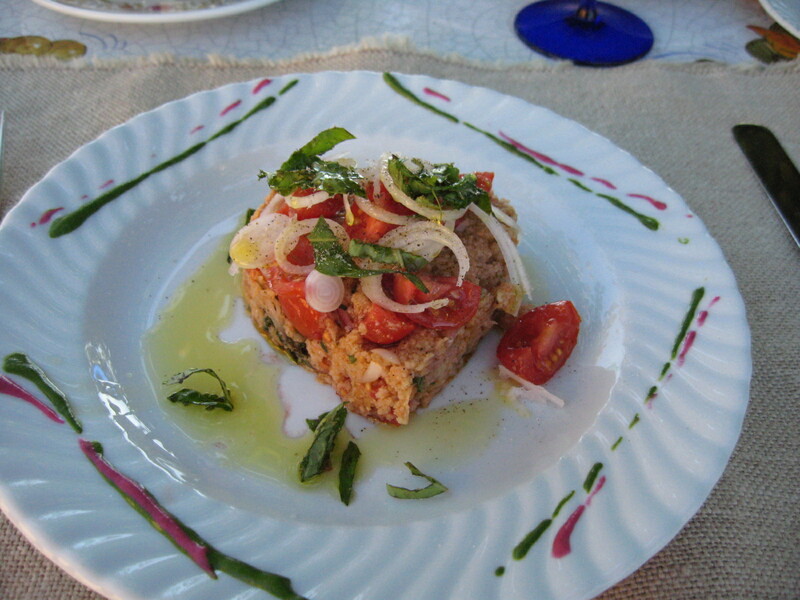 We then proceeded to have a gourmet Tuscan meal prepared by Dania and hosted by Umberto. Our gracious hosts helped us celebrate our wedding anniversary by making a “special” cake for dessert. Along with fine after diner drinks and singing Italian songs late into the evening… we really had a unique celebration. This entry was posted in Uncategorized on June 7, 2015 by Bob and Janice Kollar.